BBC Two - Trust Me, I'm a Doctor, Series 3, Episode 1 - How do I cure cramp? It can happen when you least expecting it: suddenly your calf muscle tightens and contracts, causing excruciating pain down your leg. What you have is cramp. Common as they are and terrible as they can be, the actual cause of cramps is something of a mystery and has baffled scientists for years. A cramp is a sudden and severe, involuntary muscle contraction. It can last anywhere from a few seconds to about ten minutes. It can happen to any of us, but two groups of people are particularly affected by leg cramps: pregnant women and older people. It is thought that a third of people over 60 experience leg cramps. But many people associate this severe pain with one thing… exercise. The cause of this common affliction has often been ascribed to dehydration and low salt/electrolyte levels in the body. This theory seems to have originated from anecdotal observations of labourers working on steamships and in mines more than 100 years ago. These reports noted that the workers suffered from cramping whilst sweating profusely in these hot environments, and proceeded to link cramping to excessive sweating and dehydration. However, there is still not a great deal of scientific evidence to support these theories; only a number of anecdotal clinical observations, and small case–control studies. But, the theory has been quite hard to disprove because muscle cramps are very hard to study. Not only are they often spontaneous and involuntary, but they are self-limiting, in that they stop after a short time. 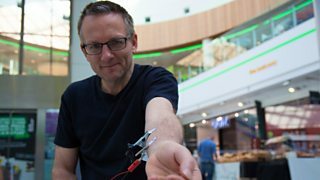 But researchers have come up with an ingenious way to induce cramp – electricity. By attaching electrodes to various points on the leg scientists can mimic this involuntary contraction and have shown, in laboratory conditions, that exercise related muscle cramping may not be caused by dehydration and salt loss, but by something else entirely. Instead, researchers are now considering the possibility that cramps are a phenomenon associated with “altered neuromuscular control,” stemming from multiple factors including muscle fatigue and damage. This would explain why the muscles affected by cramp are usually those that have been working hardest. This theory posits that your muscles are always held in a delicate balance between two types of reflex: one that encourages them to contract and one that encourages them to relax. But exercise can upset this balance and cause a cramp. What can I do when I get cramp? If you feel a sudden attack of cramp, the best thing you can do is try to reverse the contraction, by stretching the affected muscle. However, there is some disagreement surrounding the mechanism of this relief! Stretching is thought to stop cramps in two ways. First, it physically separates the muscle’s contractile proteins (actin and myosin). If actin and myosin are not allowed to interact, the muscle cannot contract. Thus, stretching alleviates cramping by not allowing the two proteins to connect. Second, stretching is also thought to cause the muscle undergoing cramp to relax via “autogenic inhibition.” In simple terms, stretching the muscle increases tension in the muscle tendon which sends impulses to the brain telling the cramping muscle to relax. How can I prevent nocturnal cramp? There are some medications that may decrease night-time leg cramps but these medications might not be effective and some are associated with some serious side effects. So if you’re wanting a cramp-free kip, you could try following some ‘Trust Me’ night-time advice. Some research has shown that muscle stretching is worth considering as an alternative therapy and may help reduce the frequency and severity of night-time leg cramps. So try gently stretching the affected muscles shortly before turning in. It may take a while before you notice an improvement. So, it is worth trying the exercises for a few weeks to see if the cramps ease off. The cramps may not go completely, but their frequency and/or severity may reduce. There are certain positions which may prevent the calf muscle from shortening, contracting or tensing when lying in bed. If you lie on your front, try hanging your feet over the end of the bed; this will keep your feet in a relaxed position. If you lie on your back in bed, try to make sure that your toes point upwards. You can do this by placing a pillow under the leg or at the end of the bed to prop up the foot and keep it in place. And finally, keeping your blankets and sheets loose this might prevent your feet from pointing downwards whilst you sleep.